EARL’s NOTE: During my last hip revision I ended up with apparent damage to my peroneal nerve – branch of the sciatic nerve – and numbness in my right foot. However, there is also numbness in the left but not so bad plus the outside of my left knee. I blamed the epidural for this as one might but who knows as there are many possibilities. I will finally get around to nerve studies with a specialist soon – only taken me a year to get myself organised! Hence the interest in this topic. Apparently nerve damage during hip revisions is not uncommon. Seek medical care right away if you notice any unusual tingling, weakness or pain in your hands or feet. Early diagnosis and treatment offers the best chance for controlling your symptoms and preventing further damage to your peripheral nerves. If your symptoms interfere with your sleep or you feel depressed, your doctor or pain specialist may be able to suggest treatments that can help. Autoimmune diseases. These include lupus, rheumatoid arthritis and Guillain-Barre syndrome. Diabetes. When damage occurs to several nerves, the cause frequently is diabetes. At least half of all people with diabetes develop some type of neuropathy. Exposure to poisons. These may include some toxic substances, such as heavy metals, and certain medications — especially those used to treat cancer (chemotherapy). Infections. Certain viral or bacterial infections can cause peripheral neuropathy, including Lyme disease, shingles (varicella-zoster), Epstein-Barr, hepatitis C and HIV/AIDS. Inherited disorders. Examples include Charcot-Marie-Tooth disease and amyloid polyneuropathy. Trauma or pressure on the nerve. Traumas, such as motor vehicle accidents, falls or sports injuries, can sever or damage peripheral nerves. Nerve pressure can result from using a cast or crutches, spending a long time in an unnatural position or repeating a motion many times — such as typing. Tumors. Growths can form directly on the nerves themselves, or tumors can exert pressure on surrounding nerves. Both cancerous (malignant) and noncancerous (benign) tumors can contribute to peripheral neuropathy. Vitamin deficiencies. B vitamins — B-1, B-6 and B-12 — are particularly important to nerve health. Vitamin E and niacin also are crucial to nerve health. Other diseases. Kidney disease, liver disease and an underactive thyroid (hypothyroidism) also can cause peripheral neuropathy. To make the most of your appointment time, it’s good to arrive prepared. Here’s some information to help you get ready for your appointment, and to know what to expect from your doctor. A full medical history. This includes your symptoms, your lifestyle, exposure to toxins, drinking habits and a family history of neurological disease. Neurological exam. This may include checking your tendon reflexes, your muscle strength and tone, your ability to feel certain sensations, and your posture and coordination. Physical exam. Your doctor will likely do a complete physical exam. Blood tests. These measure various levels, such as vitamin and blood sugar levels; and bodily functions, such as thyroid, liver and kidney. Imaging tests. Your doctor may request a CT scan or MRI to look for herniated disks, tumors or other abnormalities. Nerve function tests. These may include electromyography — which reads electrical activity in your muscles to determine if your weakness is caused by muscle damage or nerve damage — and nerve conduction studies — which assess how your nerves and muscles respond to small electrical stimuli, generated by a probe and measured by an electrode placed along the nerve’s pathway. Nerve biopsy. Your doctor may recommend this procedure to try to determine what’s damaging your nerves. A small portion of a nerve is removed and examined for abnormalities. Pain relievers. Mild symptoms may be relieved by over-the-counter pain medications. For more-severe symptoms, your doctor may recommend prescription painkillers. Drugs containing opiates, such as codeine, can lead to dependence, constipation or sedation, so these drugs are generally prescribed only when other treatments fail. Anti-seizure medications. Drugs such as gabapentin (Gralise, Neurontin), topiramate (Topamax), pregabalin (Lyrica), carbamazepine (Carbatrol, Tegretol) and phenytoin (Dilantin, Phenytek) were originally developed to treat epilepsy. However, doctors often also prescribe them for nerve pain. Side effects may include drowsiness and dizziness. Capsaicin. A cream containing this naturally occurring substance found in hot peppers can cause modest improvements in peripheral neuropathy symptoms. Like spicy foods, it may take some time and gradual exposure to get used to because of the hot sensation this cream creates. Generally, you have to get used to the heat before you can experience pain relief. Doctors may suggest you use this cream with other treatments. Lidocaine patch. This patch contains the topical anesthetic lidocaine. You apply it to the area where your pain is most severe, and you can use up to four patches a day to relieve pain. This treatment has almost no side effects except, for some people, a rash at the site of the patch. Antidepressants. Tricyclic antidepressant medications, such as amitriptyline and nortriptyline (Aventyl, Pamelor), were originally developed to treat depression. However, they have been found to help relieve pain by interfering with chemical processes in your brain and spinal cord that cause you to feel pain. The serotonin and norepinephrine reuptake inhibitor duloxetine (Cymbalta) also has proved effective for peripheral neuropathy caused by diabetes. Side effects may include nausea, drowsiness, dizziness, decreased appetite and constipation. Transcutaneous electrical nerve stimulation (TENS) may help to relieve symptoms. In this therapy, adhesive electrodes are placed on the skin, and a gentle electric current is delivered through the electrodes at varying frequencies. TENS has to be applied regularly. Exercise. Ask your doctor about an exercise routine that’s right for you. Regular exercise may reduce neuropathy pain and can help control blood sugar levels. Quit smoking. Cigarette smoking can affect circulation, increasing the risk of foot problems and possibly amputation. Eat healthy meals. If you’re at high risk of neuropathy or have a chronic medical condition, healthy eating is especially important to ensure that you get essential vitamins and minerals. Emphasize low-fat meats and dairy products and include lots of fruits, vegetables and whole grains in your diet. Drink alcohol in moderation, if at all. Acupuncture. Acupuncture involves the insertion of thin needles into various points on your body. Acupuncture may reduce symptoms in about three-quarters of people with peripheral neuropathy. However, you may need multiple acupuncture sessions before you notice improvement. Acupuncture is generally considered safe when performed by a certified practitioner using sterile needles. Alpha-lipoic acid. Used as a treatment for peripheral neuropathy in Europe for years, this antioxidant may help reduce the symptoms of peripheral neuropathy. Discuss the use of alpha-lipoic acid with your doctor before using it, because alpha-lipoic acid may affect your blood sugar levels. Other side effects may include stomach upset and skin rash. Biofeedback. During a biofeedback session, the therapist applies electrical sensors to different parts of your body to monitor your body’s physiological response to your peripheral neuropathy symptoms. The biofeedback device then teaches you how your body responds using cues, such as a beeping sound or flashing lights. This feedback can help you associate your body’s response with certain physical functions. Once you begin to recognize your body’s responses, you can learn ways to lessen the reaction through certain techniques, such as relaxation or guided imagery. Whether or not you have a medical condition, eating a healthy diet that’s rich in fruits, vegetables, whole grains and lean protein can help keep your nerves healthy. For example, nerve damage is common if you have a vitamin B-12 deficiency. The best food sources of vitamin B-12 are meats, fish, eggs, low-fat dairy foods and fortified cereals. If you’re a strict vegetarian, fortified cereals are a good source of vitamin B-12 for you, but you may also want to talk to your doctor about B-12 supplements. Regular exercise also is important. If possible, try to get at least 30 minutes to one hour of exercise at least three times a week. Earl, I wish I had your productivity, you are a ravenous researcher, your tenacity and your need to figure out why you are in this pain situation. Your case is EXACTLY the reason why I was able to stumble upon the reasons why you are still in pain and searching for a way out. I finished Med School in 1983 and I realized some patients were NOT getting better. Mostly odd pain problems. I thought I would have a career of managing these suffering miserable souls without any reasonable safe options. Something was missing!!! The harder I tried was actually making some get worse. In ‘95 a patient with fibromyalgia was getting better despite my sincere efforts with only medication options. She was also getting Acupuncture. Acupuncture was never on the table and never in my arsenal of therapies. What was this thing with little needles and now could I use this in my practice? I wanted to know! In ‘97 I took an Acupuncture course to help discover how it help my patients. After taking the best course of my life, The Helm’s course, I was still wondering why. I was trapped in a foreign language, ideas, thought process and I could not get it to match with my 12 years of medicine. Acupuncture was less than an ideal medicine. Shock was not the word for my confusion. I could not crack the acupuncture code and use it effectively in the modern era. The Helms course also taught other authors whose textbooks I purchase because they were suggested. C. Chan Gunn’s book sort of debunked acupuncture for a new vision of what was truly happening. Yes, Gunn debunked capital “A” Acupuncture, the formal discipline. Gunn thought process was simple, logical, safe, blended well with modern medicine and with traditional Acupuncture. Yes, even though Gunn debunked formal Acupuncture, he note the tool or needle of acupuncture was the key to unlock pain issues. To think Gunn you have to think flesh=muscles/tissue and NOT bone/ligament/disc/nerves! Treat the fleshy tissues which are the engines of movement. Helm’s also introduced Janet G. Travell, MD. She is the matriate of myofascial pain therapy. Travell was an orthopedic doctor in the 50-60’s who discovered that the human joints are designed to last a lifetime/100 years! She also discovered that treating the muscles would alleviate a lot of movement disorders and pain syndromes. She noted that if the muscles were treated then joints/ligament/nerve/circulatory dysfunctions would naturally resolve. How it Works-SEE the way we SEE. First, let me explain how this all-natural process works. 1. The thin flexible solid stainless steel needle is inserted into the skin and muscle and causes microscopic tissue injury. That injury triggers a healing cascade of repair. The injury is repaired and any local secondary injury is also repaired. 2. The stainless steel wire, once it enters the muscle, will trigger a muscular re-polarization and the muscle twitches. After the twitch, the muscle will relax. The relaxed muscle will be a little longer and less tense and tight. Note: Depending on how dense the problem is within the tissue, depends on how much effort you have to put into the needle to trigger both of these events. When I help my patients, I frequently need to clear up some terms used in modern medicine that have caused some confusion. Insurance companies have dictated that when a doctor punctures the skin with a needle that procedure is classified surgery. To some degree it is surgery because of the intent of the procedure. Surgery is performed to correct and fix broken tissues. An acupuncture needle is a fine thin filament flexible instrument. A hypodermic needle is a stiff hollow sharp beveled-tip instrument. Acupuncture, Capital “A” is the ancient Chinese art of healing. So Acupuncture is a surgical procedure that uses a fine flexible filamentous needle to puncture certain points in the body. Small “a” acupuncture is just puncture or puncturing of the skin using a needle into a specific predetermined location. Dry needling, using a hypodermic or an acupuncture needle as a tool to effect a cure. C. Chan Gunn, MD, from Canada uses the acupuncture needle as a probe in tight bands and trigger points to affect a cure. He calls this procedure Intra-Muscular Stimulation or IMS. While acupuncture has a rich, 3000-year history, modern thought leaders and practitioner doctors such as Janet G Travell, MD, have advanced its use. Travell’s Trigger Point Injection utilize a stiff, hollow sharp beveled tip needle to affect a cure. Needling with just the sharp needle is called Dry Needling. When a substance is injected, these procedures are called Steroid Injections, Prolo-Therapy uses glycol and there is also an injection of Platelet Rich Plasma. Therefore, most insurance companies cover most minor surgery and have fee and procedure codes for Acupuncture, acupuncture and dry needling. Allow me to use a scale of 1-5 to describe the levels of effort applied to the procedure of puncturing the skin and tissues using various types of needles. One key assumption and underlying principle in acupuncture is that muscle tightness is what is causing a lot of pain and electrical malfunction in the body. The goal is to treat the tightness so that healing occurs and all goes back to normal. Levels 1-3: Includes the traditional, formal ancient discipline from China. I will classify these levels with a capital “A”, Acupuncture. Level 1. Practitioner uses a standard set of protocols and points as dictated by tradition and wisdom. Level 2. Involves the practitioner applying more pressure and repeating pecking at the tissue. Level 3. Requires more effort and can be time-consuming so the practitioner applies heat or electrical stimulation. Sometimes the tissues are denser than the level 3 can overcome, so they require a thicker acupuncture needle and more time and patience on the part of the practitioner. Level 4: Requires an entirely different needle, one that has a sharper tip, like a hypodermic needle. Inserting the needle will not just tease the tissue but will cut the muscle fibers. The cuts trigger bleeding and as a result will reactivate the stale, stubborn tissues. Level 5: Is also known as trigger point injections without steroids. This level can be very painful so it frequently requires the injection an anesthetic or numbing medicine. In my practice I use all of these tools, hand-in-hand, in an impromptu fashion like an artist working on a painting or a musician on a production. Thanks Stephen – I need to spend more time looking into this. I have had acupuncture before and it worked well on several injuries. How does this compare with prolotherapy? This sounds like Metal on Metal hip devices could be linked to this via poisoning or toxicity from the MOM particles ? Ghee I don’t see my comment … I am confused? Hi Stephen – I have checked all the comments and can’t find one from you here ? Ah ha – found it in SPAM. Have released it. 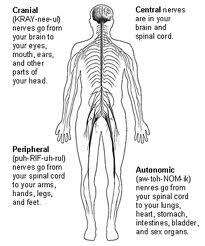 Earl’s View Blog has a great explanation of peripheral neuropathy from MayoClinic.com. If you suffer from this condition, you should definitely read it. Pingback: What Are the Symptoms of Neuropathy? Diabetic neuropathy is damage to the body’s delicate nerve fibers that results from high blood sugar. Symptoms can range from tingling and numbness to debilitating pain.